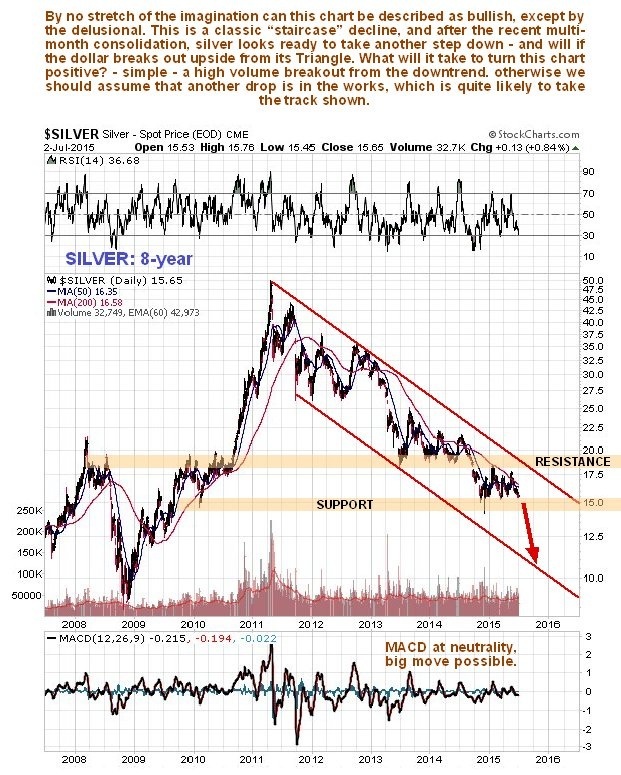 Silver’s cheerleaders are trying to keep their flocks happy by talking it up as usual, but the hard reality is that silver’s charts continue to look awful, and like it is readying for another sharp drop, which fits with our view that the dollar is getting ready for another big up-leg. 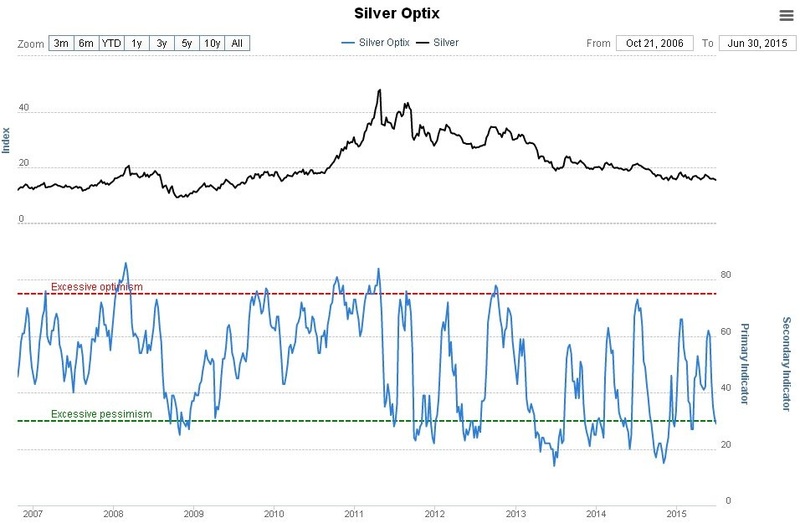 There is nothing bullish about silver’s long-term chart. It reveals an ongoing “staircase” decline in force for years now from its 2011 highs. In recent months silver has been marking out another horizontal consolidation pattern which is viewed as another “step” on the path to the next sharp drop, which may be imminent with the dollar looking ready to break out upside. If it does break down soon as expected it should drop swiftly to the lower boundary of the downtrend channel, which means that it would drop to the $11 area, as shown on the chart by the red arrow. What would it take to turn this chart bullish? – that’s very simple to say – a high volume upside breakout from the major downtrend channel, but at this point such a turn for the better looks unlikely. The 6-month chart is of little use technically, but shows recent action in detail. 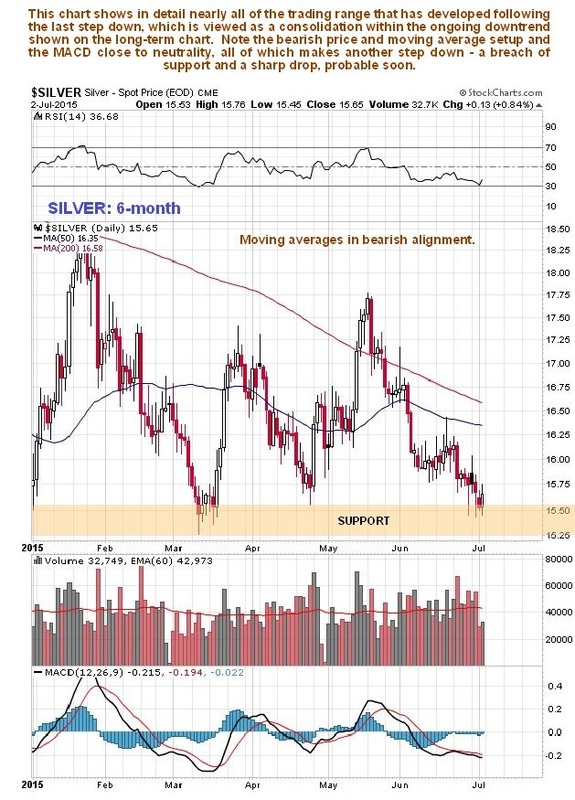 On this chart we see that silver is flirting with its lows near the bottom of its trading range of recent months, and with its bearishly aligned moving averages pressuring it more and more from above, a break to the downside is a growing probability. 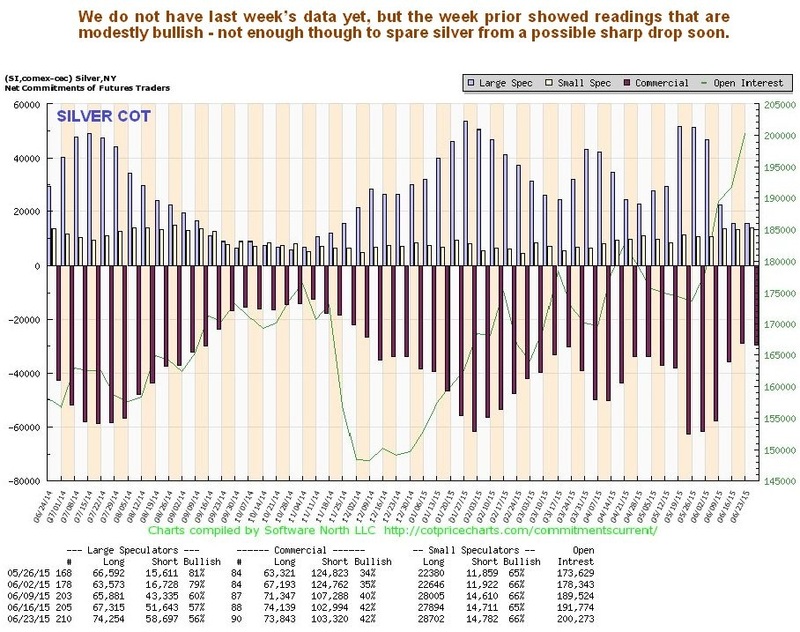 Silver’s latest COT is in middling ground and if anything looks modestly bullish, but this is unlikely to help it much. Note that this chart lacks last week’s update, probably because it has been delayed by Friday being a public holiday in the US. It will be updated after the latest data becomes available. 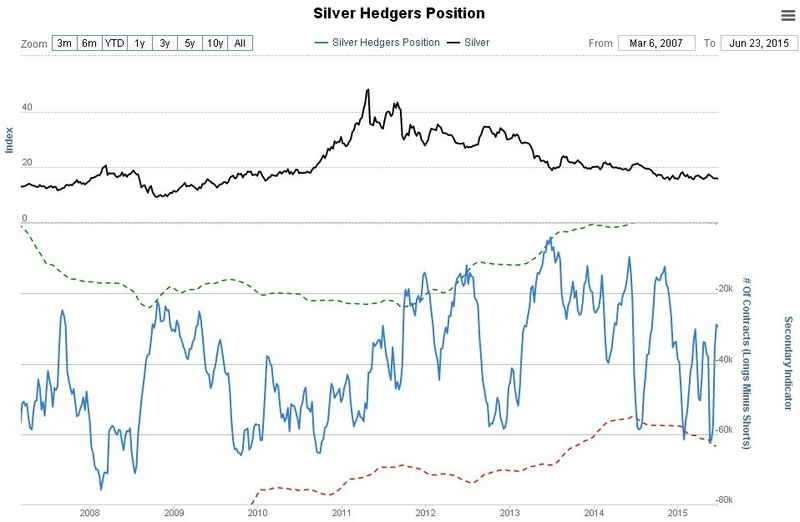 The Silver Hedger’s chart is in middling ground and doesn’t give us much of a clue about direction, one way or the other. The Silver Optix chart is starting to look bullish, but will look more bullish still if silver steps down again as expected. Gold and silver look like they are consolidating within their downtrends ahead of another sharp drop, which is expected to synchronize with another dollar up-leg. Over the longer-term, and contrary to general expectations, a mega bull market is expected to be ignited by a new cycle of rising rates, as in the late 70’s, which will devastate the inflated bond and stock markets.